Okay so here we have another 964 project thread, it’s never going to be a ‘sticky’ or at the level of Paul, Clinchy, my fellow Geordies and all; but at least it’s something for you to read. 1)	Cosmetic body work refresh – quite a big job and struggling like hell to find someone to do it (some of you know about my struggles)! 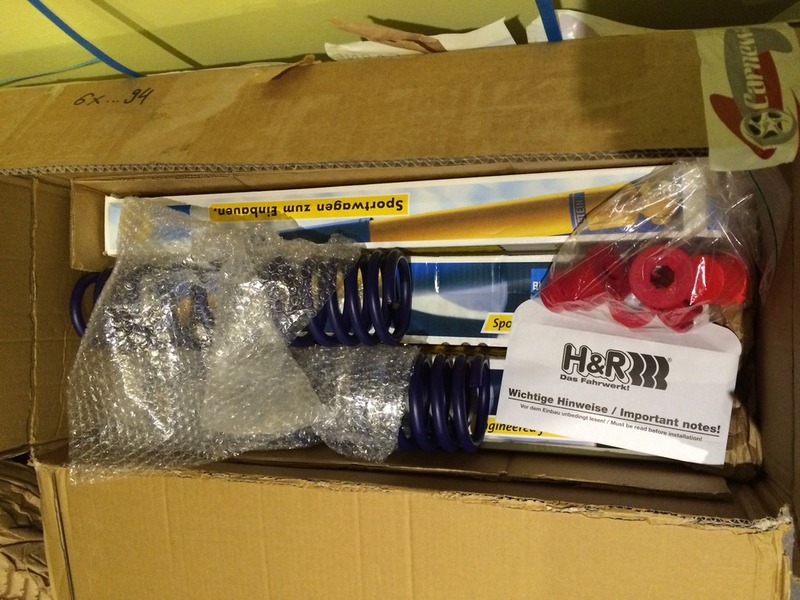 2)	Suspension refresh – I had planned to go the Bilstein B6/H&R route but have not found anyone (yet) who can supply B6s from stock for an 89 C4; seems to be a supply issue. I’ve had an enquiry with a well know Belgian supplier for a couple of months now and therefore I have started looking for alternatives, at the moment I’m investigating Silvers! Any hints on where I can source the Bilsteins would be much appreciated. I’m looking for a Euro purchase to take advantage of the exchange rate. I have a few other jobs planned but one of my strategies will be to not make any changes that cannot be reversed, I’m quite like my cars provenance and prefer the option to reverse any modifications should I choose to do so. Another strategy is to do as much of the work myself and only use professionals for specialist work. More to follow, it will be a slow burn but I have to start somewhere. I need a name for the project; how about 'Bacchus to the future'? Location: East Sheen & Barnet. I own an '89 C4 with the original, rear suspension mounts. Carnewal supplied my B6s. We had to wait a couple of months for Bilstein to make a new batch. I finally had them delivered in June. During our discussions, Gert informed me that he was the clearing house for Bilstein. I tend to believe him as he got mine delivered before any other supplier had a sniff of B6s. Yep, I'm talking to Gert. I guess I'll have to be more patient. At the moment I just want the bits in the garage piling up. It's the wrong time of year to be taking the car out of action at the weekends . About time too! I can't wait, it's not a De Lorean though is it? pss10s are probably better than my driving skills can justify but I may go that way. I've a outstanding query with FVD Brombacher about their B6 kit, no reply as yet. It heard from a German supplier the B6s may not be available until September and now I'm ready to buy I'm getting impatient. I might try and call Gert tomorrow. Hell no, although I wouldn't mind one of those Paul. Don't get too excited about my project. Whats the difference in ride quality on typical UK roads between Ps 10 and B6 guys? Bilstein PSS10 on RS settings , ride height RS + 5mm .... Loves it , the pss10 kit is adjustable to 10 different presets via a knob on each shock labelled 1-10. From memory I think I've set the rear at 4 and the front at 3. Ride on rippled road surface can initially feel,harsh, but as the speed increases this goes. Wife is happy as a passenger as was my passenger to LeMans this year. Ride is probabally not that different to my CSL. On fast country roads and it feels great with a nice predictability. Really rough stuff at speed and I think I need to soften the front as currently under heavy braking the front wheels can skip over the bumps, but bear in mind we are talking about driving pretty hard and quick to get to this point. Very excited about your project as I also have a 89 C4 that needs some TLC. I'm still saving for glass out paint job, but the list of things to do at the same time is growing so I'll be keen to follow your progress and may be pick up some parts (suspension been 1 item) if you are generous enough to post the sourcing details. Good luck fella I hope things go to plan. Good luck with the refurb. Don't forget plenty of pics and updates. I have PS10s on mine, I wanted the extra adjustability for track days. Man maths helped with the budget calculations. And another one getting some love. Get yourself a thread started with what you're planning. It'll be interesting to refer back too, when it's 54 pages and £30k different!.. I spoke to Gert are Carnewal today and he confirms September for the suspension, not so far away. On the body work I'm going back to the place Chris Dobson recommended to try and negotiate a mutually agreeable price. I can't do much with pics right now other than show you what it looks like in the current condition. I'll post a couple soon. Next job is repair/renew left side rear wheel sensor harness which is somewhat damaged and may be contributing to my PDAS/ABS warning light discotheque - to many threads on that subject already! Gratuitous pic of my parcel of goodies below. I've already bought most of the minor parts from OPC but I'll do a check to see if its worth replacing other suspension bits whilst I'm on the job. I hope you didn't pay express on the parcel? I thought I would take the opportunity to post a brief status update, thank you all for the inspiration and wish you all the best for 2016. After the delay due to the time I spent tracking down my accelerometer problem (reported separately) I am finally starting to make a little progress. 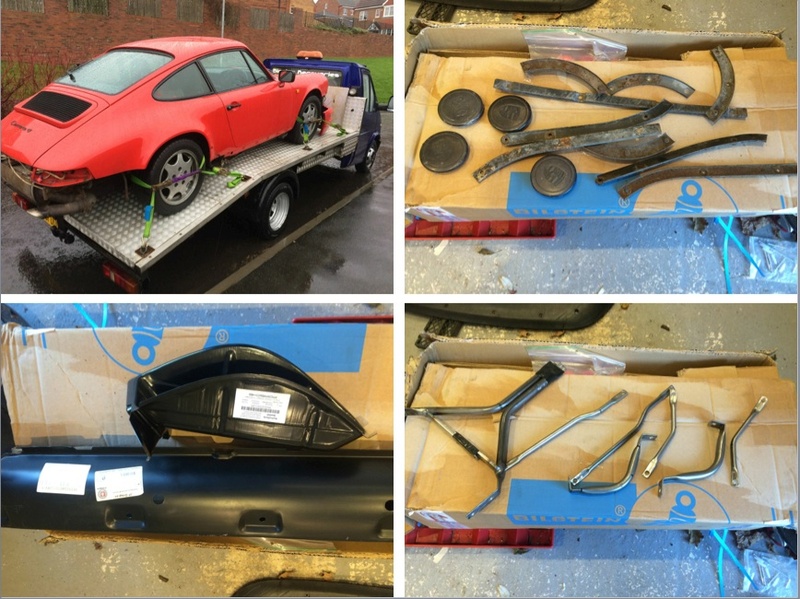 - Off she goes to the body shop to keep Ian's 928 company. - Various brackets ready for blasting and powder coating. - New brackets ready for powder coating. - Some repair parts for Garry to use as he wishes during the work on the body, only a small piece of the outer sill will be used; just bought it to get the pressed portion with the hole for mounting the plastic sill cover. The left rear light enclosure is starting to go so i've decided to have it replaced. As soon as the car is back then I'll fit the new suspension, which is patiently waiting in the box, and then we will see what is next on the list. Great to see you up and running. How are your getting on with the brackets?